Take prompt action once some applications attempt to make modification without your permission. This protector will identify and stop any processes that try to secretly change Windows registry. Prevent programs from changing your Internet Explorer homepage. Prevent any unwanted new application from adding into the windows startup. Prevent changes to the default browser. World’s Fastest System Optimization Tool. Your Ultimate Computer Privacy Protector. 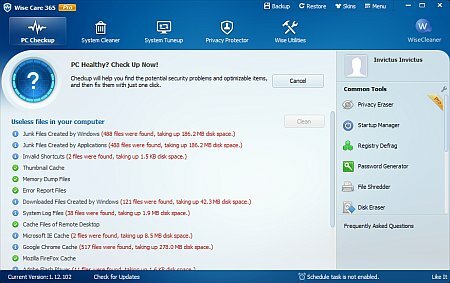 Wise Care 365 protects your computer privacy from prying eyes. Privacy Eraser erases all traces of any computer operation like browsing history and accessed files, so any computer operation you do stays confidential. Disk Eraser prevents deleted data from being retrieved by third parties. Disk Shredder can delete files thoroughly so that they can never be recovered. A Powerful System and Hardware Monitoring Utility.